The SE8 card provides a simple way to expand one FPGA port into eight. The card has 32 binary output lines arranged into four groups of eight lines. The outputs go to the same type of 16 pin connector found on the FPGA card. This lets a single FPGA card control up to 64 quad relay cards, or 64 quad open-drain driver cards, or 64 USB hub cards. The schematic and layout of the SE8 are shown below. 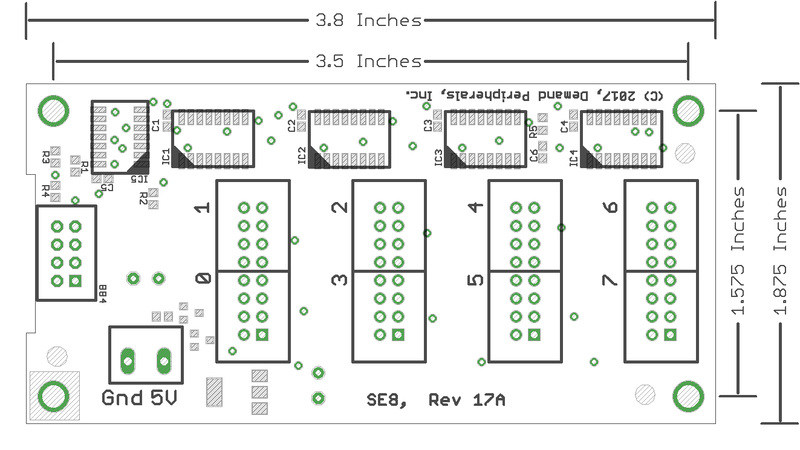 The Eagle schematic and board files are available here: se8.sch and se8.brd. The bill-of-materials is available here: se8.txt.